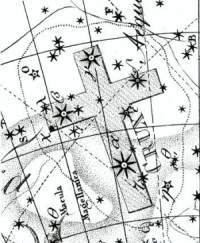 The most famous of the southern circumpolar constellations is the Crux, the Southern Cross. Although it is a very small constellation (in fact, the smallest) it contains three first magnitude stars and six others of magnitude less than 5. The brightest star of the constellation is Alpha Crucis, or Acrux (mag. 0.87) which forms the southern tip of the cross. Next in brightest are Beta Crucis, or Mimosa (mag 1.28), Gamma Crucis (mag.1.69) and Delta Crucis (mag. 2.81). We can see the Crux over the southern horizon from all places south pf Bhopal (lat. 23°20´ N). From Kanyakumari (lat. 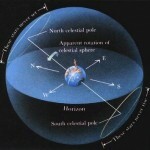 8° N) we can see it all through the night for almost two months (from the first week of April to the end of May) when it can be seen to rotate round the imaginary south celestial pole (below the horizon) in a clockwise direction. 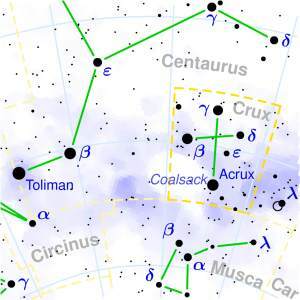 As a highly distinctive asterism, Crux has great significance in the cultures of the southern hemisphere. In Australian Aboriginal astronomy, Crux and the Coalsack mark the head of the ‘Emu in the Sky’ in several Aboriginal cultures, while Crux itself is said to be a possum sitting in a tree. Also, pertaining to the library of aboriginal star-lore, Crux is a representation of the sky deity Mirrabooka. In Australia it also has significance as it was on the Eureka Flag, the battle flag of the Eureka Stockade. It has since continued as a symbol of revolution against oppression, including both ends of the political spectrum, but mostly for its original association with class equality. A stone image of the constellation has been found at the archaeological site of Machu Picchu, Peru.In Mapudungun, the language of Patagonian Mapuches, the name of Crux is Melipal, which means “four stars”. In Quechua, the language of the Inca civilization, Crux is known as “Chakana”, which means literally “stair” (chaka, bridge, link; hanan, high, above), but carries a deep symbolism within Quechua mysticism. The Māori name for Crux is “Te Punga” – “the anchor”. It is thought of as the anchor of Tama-rereti’s waka (the Milky Way), where the Pointers are its rope. In Tonga it is known as Toloa—duck; it is a duck flying over, heading south, and one of his wings (δ) is wounded because Ongo tangata—two men—α and Β Centauri threw a stone at it. The Coalsack is known as Humu—triggerfish, because of its shape. In Indonesia and Malaysia, it is known as Buruj Pari (The Stingray). 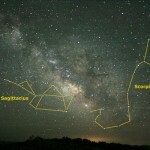 In ancient Hindu astrology, the modern Crux is referred to as “Trishanku”. Argentine Gauchos are well known for using it for night orientation in the vast Pampas and Patagonic regions. It is also of cultural significance, as it is referenced in several songs and literature. Beginning in the colonial age, Crux became used as a national symbol by several southern nations. 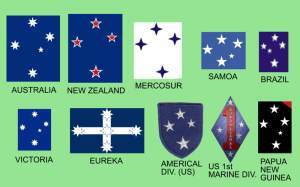 The brightest stars of Crux appear on the flags of Australia, Brazil, New Zealand, Papua New Guinea, and Samoa. They also appear on the flags of the Australian state of Victoria, the Australian Capital Territory, the Northern Territory, as well as the flag of Magallanes Region of Chile, and several Argentine provincial flags and emblems (e.g., Tierra del Fuego and Santa Cruz). The flag of the Mercosur trading zone displays the four brightest stars. Crux also appears on the Brazilian coat of arms. Copyright © 2011 Space Yuga. All rights reserved.